1) Back on December, 20 I had an article published over on Engineer Blogs about the differences between school and work. Chris and the other EB writers were kind enough to offer me a spot guest writing for their site after I submitted the piece for their consideration. For the time being I will be submitting stories to EB for your enjoyment on a part-time basis and will work up to one day joining the team as a full-time author. 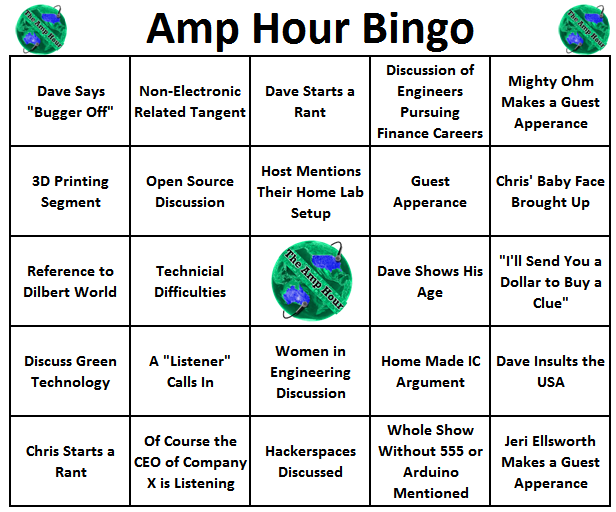 3) The Amp Hour Bingo will be getting some updates in order to make it easier to win and more fun to play. For those of you who play along like I do I’m sure you’ve noticed it’s basically impossible to BINGO while listening to the podcast. As far as I know I’m the only one who has gotten a BINGO and it’s only happened once. Roel and I brainstormed a bit and came up with a way to place the tiles more efficiently so the most common aspects of The Amp Hour are always used when a board is generated and the rest serve as filler. Other features to add were also discussed including saving a board and posting results Twitter. I don’t know when exactly these changes will be put into place since I’m dead weight when it comes to coding but when Roel finishes them I’ll be sure to make it known. So yeah, that’s what I’ve got for you at the moment. Thanks for checking out the site and reading my posts over these last 8 months or so. It’s been a lot of fun so far and I plan to keep writing in 2012 and longer assuming the world doesn’t end next December. Once my thesis is finally wrapped up I can even post on a more frequent basis too! As a frequent listener to The Amp Hour may know, there are certain aspects that seem to repeat themselves. These things could be anything from the infamous “Will we ever make ICs in our basement?” argument to phrases Dave says like “Bugger Off.” Therefore, I propose the creation of a Bingo game based upon the show. Listeners can play along discreetly if they’re at work or at red lights if driving. Otherwise just keep the sheet out on your desk and play along as you listen. I’ve posted an example board below. It’s nothing special, I just did it in Excel pretty quickly but perhaps if enough people got on board there could be a web app that generated game sheets or something. The squares are filled with what I think are the most frequent elements of the show (though a whole show without mentioning the 555 or Arduino may be a challenge) and are all meant to be in good fun. If you’d like to play along just download one of the Excel files below containing a Bingo board. I’ve tried to make them as different as possible so you could play multiple sheets at once but if there’s any issue with their layout let me know. If you have any suggestions for new squares I’ll start another sheet or if anyone makes their own board sound off in the comments and I’ll link to it for others to use. Good luck! Update: With many thanks to Roel Adams we now have an online version of The Amp Hour Bingo! The site will generate a random board for you to play when you visit the page and is infinitely better than filling in Excel tiles. Keep listening to The Amp Hour and be sure to play along!